The original ballet Don Quixote, a Spanish rom-com based loosely on a relatively minor incident taken from Cervantes's original tale, was created in 1869 by the choreographer Marius Petipa in collaboration with the composer Ludwig Minkus. These days, as both Moscow's Bolshoi and St Petersburg's Mariinsky companies regularly take it on world tour or transmit it to global cinema audiences, Don Quixote has become one of the best known and most popular 19th century ballets. For almost a century after its creation, however, the complete original version had been little seen or appreciated outside of Russia. Much as the Soviet government lionised its star dancers at home, until the 1950s it was reluctant to authorise foreign tours that might offer them the opportunity to seek political asylum in the West. It was, in fact, the most famous such defection - that of Rudolf Nureyev in 1961 - that was to familiarise audiences outside the USSR with Don Quixote - or, at least, with what was to become one particular version of it. The ballet had actually provided Nureyev with one of his greatest early triumphs before he had left Russia. Rather than simply repeating that success on its own terms, however, once ensconced in the West he soon decided that he would rework the traditional version quite significantly. It was to be reimagined as a star vehicle to promote himself to a mass audience, while simultaneously establishing his credentials as a budding choreographer. That meant, in practice, beefing up his own role and then creating what amounted to a Don Quixote-lite by shortening and simplifying the story, putting greater emphasis on the plot's frequent moments of slapstick comedy and commissioning John Lanchbery to reorchestrate - and, where required, even to rewrite - Minkus's original score so as to give it a lighter, more "contemporary" sound. Nureyev's superstar status as one of the swinging '60s "beautiful people", the fact that his approach to the old warhorse Don Quixote fitted the iconoclastic Zeitgeist, and the original version's relatively low profile all meant that his extensive revision - usually billed as Rudolf Nureyev's Don Quixote - successfully established itself in the repertoire of several leading companies. Consequently today's collectors of ballet on DVD/Blu-ray can choose between several filmed performances. As well as this new release from the Wiener Staatsballett, there is a 2002 performance by the Paris Opera Ballet (review) and a more recent one from Milan's La Scala featuring the star casting of Natalia Osipova and Leonid Sarafanov (review). There is also a well-known film made in the 1970s for cinema exhibition that, while of some historical importance in that Nureyev himself danced the role of Basil, lost any real claim to definitive status because of the hasty and uncomfortable circumstances of its production (review). 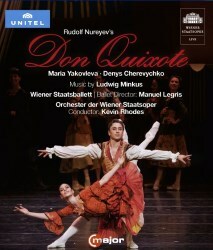 It's understandable why Rudolf Nureyev's Don Quixote has kept its place in some ballet companies' repertoires. The man himself, of course, remains the best-remembered male dancer of the past century and, as such, his name alone, especially when placed above the title, is enough to act as a powerful audience draw. Let's not forget, too, that - largely thanks to Nureyev's own personal legacy - we live in an age where male dancers are particularly prized, touring the world in sell-out testosterone-fuelled extravaganzas like Kings of the Dance that have no real equivalent for women dancers. Bearing that in mind, the showy, high profile roles that Nureyev accorded to Basil and, to a lesser extent, the glamorous matador Espada, also help cram bottoms onto theatre seats. More cynically, perhaps, I also suspect that Rudolf Nureyev's Don Quixote, being somewhat more condensed and smaller in scale than the grand spectacle that Petipa/Minkus designed for Tsarist Russia's imperial theatres, is simply less costly for ballet companies to mount. Nonetheless, it is, in at least one major respect, a significantly flawed piece, with its deficiencies coming clearly into focus now that performances of the original Petipa/Minkus version are much more accessible than they used to be. The basic problem is that this mid-20th century version of the ballet has dated far more than its 19th century predecessor. Nureyev's choreography is generally not the problem. It is certainly always interesting and often attractively inventive, especially in episodes where he deploys the corps de ballet dancers en masse. What does jar, however, is his reworking's overall mood. It is unmistakably 1960s - a decade that, in a longer perspective, we can now appreciate as very much a one-off and quite out of kilter with both its neighbours and our own times. Comedy, in particular, dates badly: thus, Nureyev's idea of playing a final joke on Don Quixote by adding a brief episode of cross-dressing for the perpetually mincing, preening and simpering fop Gamache probably brought the house down at the 1966 Vienna premiere but merely bemuses today's more gender-fluid audiences. An even greater problem arises, for me at least, with the score. John Lanchbery was a highly skilled musician who, to be fair, was only carrying out the instructions that he'd been given. But when he later described his approach to Minkus's original score as merely "cleaning it up a bit" he undoubtedly downplayed both the extent and the nature of his alterations. While he happily interpolated, for instance, music from Minkus's "Indian" ballet La bayadère into Don Quixote's decidedly "Spanish" Act 2, he was equally prepared to excise altogether the attractively jaunty march that introduces the final wedding festivities. Moreover, some of Lanchbery's reorchestrated passages are, to my own ears at least, so irredeemably dated or even downright twee that they bring to mind those bland soundtracks to 1960s Look at life cinema fillers or, even worse, accompaniments to Benny Hill TV skits. If it ever shared such reservations, the Wiener Staatsballett has clearly parked them to one side as it now releases its own version of Rudolf Nureyev's Don Quixote. It's worth noting at this point that since 2010 the company's director has been Manuel Legris who, during his time as a dancer at the Paris Opera Ballet, was something of a Nureyev protégé. Since taking charge at Vienna, M. Legris has consistently promoted his mentor's choreography, for, as well as this production of Rudolf Nureyev's Don Quixote, Staatsballett audiences have also been treated to both Rudolf Nureyev's Swan lake (review) and Rudolf Nureyev's The nutcracker (review) - though, thankfully, Nureyev didn't presume, in those cases, to tinker with Tchaikovsky's orchestrations. Those more familiar with Bolshoi or Mariinsky productions will begin to note idiosyncratic touches as soon as this production begins. The Don's fantasy ideal woman, Dulcinea, makes an unexpectedly early appearance in the Prologue, for example - which is also where we discover that Sancho Panza, an entirely secular sidekick in both Cervantes's novel and the Petipa/Minkus ballet, has inexplicably been reimagined here as a mendicant friar, albeit one apparently unfamiliar with the spiritual aspirations of poverty and chastity. Act 1's set is not the harbourside that be we're generally familiar with, but a town square dominated by large turrets topped with enormous artillery pieces. While it offers plenty of space for the dancers, I sometimes felt that it could have been better used – and, in particular, that the corps de ballet could have been more imaginatively deployed on its fringes so as to convey the atmosphere of a bustling urban environment more convincingly. Although Maria Yakovleva and Denys Cherevychko, in the roles of Kitri and Basil, may not initially appear to be the best physical match, they quickly demonstrate both a strong emotional rapport and oodles of sheer charisma. Their technique is, moreover, not in question. Cherevychko, as Basil, consistently makes more of an impression, I think, though that may simply be because, as already noted, choreographer Nureyev created lots of eye-catching opportunities for flashy dancing and comic mugging for himself and his successors in that role. Cherevychko certainly takes full advantage of all of them. If Ms Yakovleva has slightly fewer opportunities for crowd-pleading virtuosity in the first Act, she makes up for it by demonstrating that she's quite at home with the comic side of her role too, so that the frequently bickering lovers' relationship emerges as an entirely believable one. Their climactic Act 1 pas de deux is very well executed, with strong lifts from Cherevychko, and wins a deserved ovation. The secondary pair of lovers, Espada and the street dancer, also perform well. In this case, though, I think that it's the woman - Ketevan Papava - who makes the stronger impression. I was pleased to see, incidentally, that the Health & Safety brigade's influence hasn't yet reached Vienna, for, in her big set piece, she is allowed to pirouette around exposed knife blades rather than just a line of goblets. Ms Papava's partner, Roman Lazik, demonstrates sound technique and flourishes his matador's cape with the best of them but needs to smile more and look more self confident if he is to command the stage as Espada, the town beefcake, should. Kitri's unnamed "friends" also dance well, but fail to make much of an individual impression, if only because they have been identically costumed and so in practice it's difficult to tell one from the other. Nureyev neatly simplified Act 2 so as to make the plot a little easier to comprehend. The gypsies dance with colour and energy in this production and there are several neat touches that work well. The decision to use children to act in the puppet show is a good one, and the designer who came up with the idea of using umbrellas to portray nightmarish ghouls also deserves a pat on the back. The Don's vision of Dulcinea, floating ethereally behind gauze, is another effectively conceived image. While the subsequent set for "the enchanted garden" is unimaginative to the point of being decidedly penny plain, the performances by Ms Yakovleva (doubling up as Dulcinea), Olga Esina (luxury casting in the role of the queen of the dryads) and Kiyoka Hashimoto as Amor are first class. Incidentally, while Amor is often portrayed as a slight, androgynous figure - presumably to emphasise her similarity to our traditional conception of Cupid - on the Staatsoper stage she is recognisably a woman. A well executed pas de cinq gets the final Act off to a good start and is soon followed by an effective bit of comic business between the lovers during Basil's pretended suicide in the tavern (bravo, by the way, to Cherevychko for some quick-thinking improvisation when the prop knife unexpectedly malfunctions). While that sort of comedy is effective enough, Nureyev's over-indulgence in slapstick humour is apparent during the subsequent duel between Don Quixote and Gamache. That's an episode that goes on for too long and isn't really amusing at all unless your sense of humour hasn't yet developed beyond appreciation of the aforementioned Benny Hill. The second part of the third Act depicts Kitri and Basil's wedding. In the Petipa/Minkus Don Quixote the festivities take part at a ducal court but, with Nureyev having guillotined the aristocracy entirely from his production, the setting here is - for no apparent reason that I can see unless the bride's father Lorenzo was offered a good deal on the venue - another gypsy encampment. The Act 3 pas de deux is one that often brings the house down and, on the basis of the performance so far, that's what I had anticipated finding here. Unfortunately, while Cherevychko is still at the top of his game as he demonstrates some spectacular leaps around the perimeter of the stage, Ms Yakovleva appears a little tense during her solo dance with the fan and uncharacteristically unsteady and imprecise during her climactic sequence of 32 fouettés en tournant. As a result, the pas de deux doesn't, I think, quite provide the satisfactory climax and emotional catharsis that we might expect. I do have a cautionary note too on the technical side. While the production has been generally well filmed, the image on my Blu-Ray disc was not as pin sharp as it might have been. In particular, it demonstrated a problem that sometimes arises in filmed ballet when Blu-ray technology has to cope simultaneously with three competing elements: a moving camera that is tracking a dancer moving quickly and laterally across the stage while there are static figures in the background. On such occasions those background figures can sometimes be reduced to eye-bogglingly indistinct blurs. After identifying three instances of that phenomenon in quick succession at 21:28, 23:07-23-21 and 24:54-24:58 I gave up noting them down. I really don't want to make too much of that issue for I suspect that many viewers, while understandably focusing on the foreground action, may not even notice it at all and certainly won't have had their overall enjoyment compromised. All the same, I do wonder whether, after all these years, this well-documented technical glitch might be resolved if video directors anticipated where such problems might occur and filmed such episodes with a static camera taking in the whole width of the stage from a position just a little further back. That issue aside, if you're an admirer of Rudolf Nureyev's Don Quixote - and are happy to accept the premises underpinning his conception of the ballet - this version is probably now the one to have. It's a quality production that's been very well cast and delivers almost everything that you might expect of it. Lighter-hearted in tone than the somewhat reverential Paris Opera Ballet production and boasting, in Yakovleva and Cherevychko, a far more convincing pair of lovers than the competing Milan production's Osipova and Sarafanov, it now heads the field.